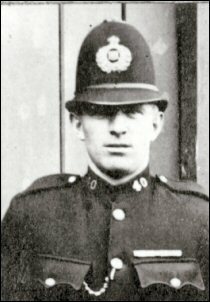 PC 40 Thomas Johnson, nick-named ‘Snowy’ by his colleges (owing to his very light brown, almost blonde hair), was born on the 15th April 1896 at Stowe in Buckinghamshire. 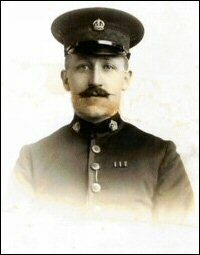 He was 23 years old when he joined the Buckinghamshire Constabulary on the 14th April 1919. He took the declaration on the 24th June that same year. He was described as 5 feet 11 inches tall, of medium build, with blue eyes. His trade was that of a Market Gardener. Prior to joining the Bucks Constabulary he was in the Royal Bucks Hussars from the 17th April 1915 to the 27th February 1919. He was shot in the ankle during his period of service. On the 23rd June 1919 he was posted to Aylesbury. His pay was forty shillings a week. One and a half years later, on the 14th December 1920, he moved to Marlow where, after only three months, on the 8th March, he transferred to Newport Pagnell on the Northern Division. The records say that he was " allowed to marry by special permission owing to certain circumstances ". He remained at Newport Pagnell until 19th April 1923, when he moved to Hanslope. On the 22nd October 1928 he was commended for " valuable and creditable work in a bad case of horse cruelty at Hanslope " which had occurred twenty days earlier. He left Hanslope sometime during May 1937 and was posted to Woburn Sands where he remained until he retired on the 14th April 1945, with a pension of £320.18s.0d, having served 26 years in the Police Force. He died in May 1963, and was laid to rest in Wavendon Church Yard. He was married and had a daughter and two sons. In September 1996, one of the two sons of Thomas Johnson, was traced to an address in Wavendon Milton Keynes (not far from Woburn Sands Thomas Johnson’s last posting). William Johnson then 73 years old, produced a photograph, three medals, two from Thomas Johnson’s 1st World War service the other being the 1937 commemorative Coronation Medal, issued to him on the 20th May that same year, also a bullet that was taken from Thomas Johnson’s ankle when he was shot in the 1st Word War, he even had part of the sock he was wearing at the time. These were treasured possessions of William Johnson who was clearly very proud of his father. 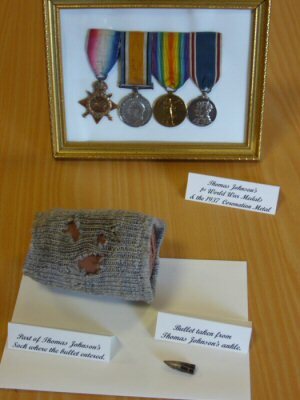 William discussed with his brother donating all these items to the Police Museum at Newport Pagnell. They decided this was the best course of action and a nice way for them to be preserved as they were part of 1st World Wars history. Unfortunately in late September 1996 William Johnson’s home was broken into and property, including the items mentioned, were stolen, leaving the Johnson brothers very upset, and a museum without a valued addition to their collection. Amazingly enough during December 1997 the medals, bullet and part of the sock were mysteriously returned though the letterbox at William Johnsons house late at night. I was contacted and William gave the items to me to arrange for them to be displayed in the Police Museum at Newport Pagnell. When the museum was closed they were put on display at the Police Station at Milton Keynes with other historic items where they remain today. William got his wish after all! Police Constable 65 Enos Climer. Police Constable 65 Enos Climer joined PC Stephen Jennings at his Bradwell posting on the 26th July 1898. Enos was married with two children, Gerald aged 3 and Horace aged 1. He married his wife Kate around 1893. Enos, who was born at Grendon Underwood on the 2nd May 1865 was employed as a servant on leaving school before joining the Buckinghamshire Constabulary on the 25th July 1892. At the time of joining his build was described as spare. He was five feet nine inches tall with light brown hair and had light blue eyes. His first posting as a 3rd class constable was to Wendover on the Central Division where he remained for only two months before being moved to Olney on the Northern Division. Promotion to 2nd class came on the 31st July 1893. Exactly one year later he was posted to Drayton Parslow but it was not until 11th June 1897 until he was promoted to a 1st class constable. John Govier’s promotion to sergeant and consequent move left a vacancy at Bradwell and Enos was sent to fill it. With his wife Kate and their two children they moved into 7 Glyn Street where they were to spend the next four years. He was promoted to merit class constable on the 16th January 1899 and a year later on the 14th January 1900 their third child Percy was born at their home in Glyn Street. 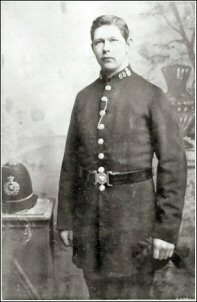 Percy John Climer was to later follow in his father’s footsteps and join the Bucks Constabulary. On leaving school Percy became an apprentice baker. 1914 saw the outbreak of the First World War and Percy tried to join the Army but, being only fourteen or fifteen, the local recruiting sergeant sent him home. At the age of sixteen he decided to travel to Aylesbury where no one knew him and at the recruiting office there he enlisted in the army. In 1918 after the war Percy was keen to join the Police Force but it was not until the 4th April 1921 that he finally took the step and became police constable collar number 151. Percy never wanted promotion - his only ambition was to be a constable just like his father. 1926 was a troubled year for the police. Not only did they have to contend with the General Strike but officers from the Bucks Constabulary were called upon under a Mutual Aid Scheme to go to Derbyshire to help police the great Coal Strike. Percy was one of a contingent of twenty constables and a sergeant under the command of Inspector John Neal that was sent to police the strike. They were stationed in a small colliery town called Clowne along with a sergeant and ten men from the Surrey Constabulary. Strange how history repeats itself, in the mid - 1980s myself, along with hundreds of police officers from all over the country, were sent on the Mutual Aid Scheme to police a similar miners’ strike. The following year, whilst stationed at Waddesdon, Percy married Emma Thorne. He met her one-day when he stopped for petrol at her father’s garage. During his service Percy’s postings included Brill, Ickford and Slough until his retirement in 1950. His record stated that during his service his conduct was “Exemplary”. On the next page is a photograph, which was on a postcard Percy sent to his mother in 1926 from Clowne. He is the second from right in the front row. Percy died in 1989 at the age of ninety at the Mid-Bucks Residential home at Western Turville. To return to Percy’s father Enos  in 1902 Enos and Kate had their fourth child, Lewis and about this time they moved to a new posting at Wavendon. During this posting two further children were born - their first daughter Gwendoline (1904) and Hilda who was born two years later. The picture below shows Enos’ wife Kate and their daughter Hilda (holding the baby). It was taken during the late 1920’s. In 1907 Enos received the first of two disciplines he was to acquire during his service - both were at Wavendon. Chief Constables Office, Aylesbury, 16th November 1907. Police Constable 65 Enos Climer is severely cautioned for being under the influence of drink on the 6th instant. Signed Otway Mayne Major, Chief Constable. Chief Constables Office, Aylesbury, 23rd October 1908. Police Constable 65 Enos Climer is severely reprimanded for having been under the influence of drink when on duty on the night of the 13th instant. The Railway fare incurred by him in attending at this office to answer the report will be disallowed. On the 13th April 1909 the family moved to Hanslope where their last child Ena May was born on the 19th May 1911. Hanslope was where Percy first went to school. His father Enos would take him on his bicycle wrapped up in his police cloak. They were at Hanslope for only two years and nine months when he was posted to North Crawley. Enos was at North Crawley for only one year and ten months when, during the evening of Saturday the 8th November 1913, he tragically died. It appears that at around 10pm, whilst on duty, he was late for a conference point with his sergeant, having been delayed to sign a pig register. He was cycling down the Chichley Road when a man named Joseph Cooper, who was said to have been drunk at the time, staggered out into the road. Enos swerved to avoid him and ran straight into a tree and knocked himself out. Some of the locals carried him to the police house in the village on a hurdle and a Mr. Stanton (whose daughter later married Enos’ eldest son Gerald) went to fetch the doctor from Newport Pagnell. Unfortunately his injuries were such that he died within a short time of being conveyed to his house. A verdict of “Accidental Death ” was returned and a vote of sympathy was passed to his widow and six children at the inquest held in the same village. On the day of the funeral a number of his colleagues, including Superintendent Pearce, Inspector Callaway, Sergeants Honour and Chilton, Police Constables Becket, Britnell, Holloway, Taylor, Sybil, Grace, Keene, Bosher and his colleague at Bradwell, Stephen Jennings were present, some acting as bearers. Chief Constables Office, Aylesbury, 10th November 1913. Police Constable 65 Enos Climer, having expired on the 8th instant is struck off the strength of the Force from that date. Chief Constables Office, Aylesbury, 11th November 1913. On the recommendation of Supt. Pearce a grant of £5 from the above Fund is made to Mrs. Climer on account of the current expenses connected with the death of her husband PC Climer. Chief Constables Office, Aylesbury, 6th January 1914. The widow of deceased Police Constable 65 Enos Climer is granted a gratuity of £130.2.5, an average of one month’s pay for each completed year of service. 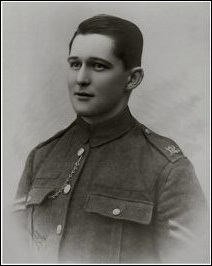 Enos had served twenty-one years and ten months in the Buckinghamshire Constabulary. He would have possibly retired sometime during the next nine years or so  maybe even less. Both he and Kate liked living in North Crawley and it was their intention on his retirement to settle there on a smallholding for their remaining days. During the early days the Superintendent or Inspector lived at the police station with his family. I respectfully beg to report that in consequence of my stomach and bowels being poisoned with sewer gas from the defective drains at this Station, I have had to receive medical attention. I respectfully beg to be allowed to continue this as it will take some time to work the poison out of my system. I hope to be able to continue-without going on the sick list- but I shall have to take things easily for some little time. I am pleased to be able to report that there is a slight improvement in my condition. As promised, I am letting you know the result of the operation on Superintendent Dibben. His operation took place to-day, but, unfortunately, Mr. Sherren found him to be suffering from Inoperable Carcinoma  therefore nothing could be done for him. You will, I am sure, understand that the patient will not be told this  at least at the present time  but his wife will be told of her husband’s condition when she comes to visit him. I am sorry to have this news to send you. I respectfully beg to report that Supt Dibben is gradually getting weaker. His nurse informed Segt Neal at 9.30 this evening that she did not think he would live through the night. I was at Newport Pagnell this afternoon, and was informed the Supt did not know anything for most of the time, but at times he rallied for a few minutes, and could just recognise those about him. I shall be visiting Newport Pagnell tomorrow (Thursday) morning, as there is a special Court to take a fraud case. I shall be leaving Bletchley about 10 a.m. I will telephone before should Supt Dibben expire. E Callaway  Inspector i/c. I respectfully beg to report that Supt Dibben died at 9.50 a.m. to-day, Thursday 9th February, 1922. the Supt. Passed away while unconscious. He did not regain consciousness after his sister saw him on afternoon of 8th. I regret to inform you that Superintendent Evelyn Dibben expired at Newport Pagnell Police Station on the 9th instant. He joined the Force on 25th July 1899 and has 22 years approved service. His rate of pay at the time of his death was £460 per annum. The widow still resides at the Police Station, Newport Pagnell and when she removes I will again communicate with you. Superintendent Dibben died at Newport Pagnell Police Station 9th February 1922. Widow granted a pension of £50 by the Standing Joint Committee on the 4th April 1922.